Alyson Thomas' playful illustrations feature essential smoothie ingredients for four tasty combinations. Attorney-turned-artist Alyson Thomas' hand-drawn graphics mean the recipes for four classic smoothies are always at hand. 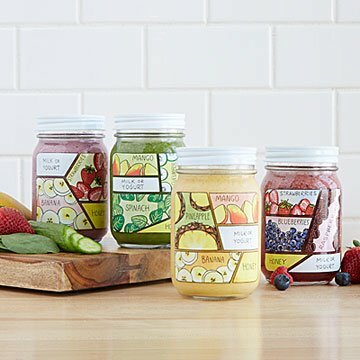 On this Mason jar set are playful renderings of essential smoothie ingredients: mango, cucumber, milk/yogurt, and honey, for example (we secretly call that combination Sunshine in a Jar). The 16-ounce jars also come with lids, so toting them to yoga or on a walk is easy. Colorful and clever, they're a fun gift for the friend who's into healthy living—as long as it tastes delicious. Available in pairs, or get all four together for a complete set. Includes a booklet full of refreshing recipes. Glassware made in the US. Decorated in Edina, Minnesota. Alyson Thomas' career started in a very different place—the Department of Homeland Security. From doodling in meetings, to turning in her badge and spending a year on a drawing project, her love of illustration eventually blossomed into a full-time business. Her accurate and amusing glassware is designed to brighten the bar of the mixology novice and expert alike. As a former attorney, one of her favorite parts of the design process is the research stage. "I'm inspired by my desire to learn more and then share that information with others," she says. "It's helpful to have a visual representation of what goes into various cocktail...you can understand more about how drinks like Bloody Marys and margaritas come together." Read more about Alyson's creative cocktail illustrations on our blog!